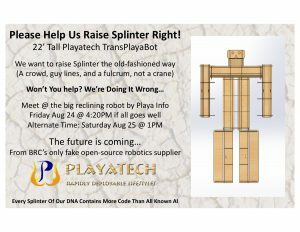 This is the story of Splinter, Playatech’s first TransPlayaBot. 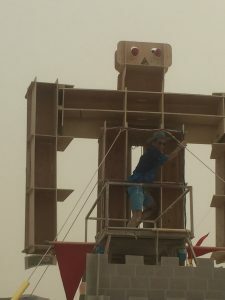 Made of 7 Playatech couches and a little chair, he stood 23 ft high for 8 days, perhaps the tallest classic robot shape at BM18. And we raised him the old-fashioned way: a crowd and guy lines, not a crane. Splinter could not walk or talk, but his shoulders shimmied in the wind, and he has already evolved to seat 36 which is more than Siri, Alexa, and Google combined. 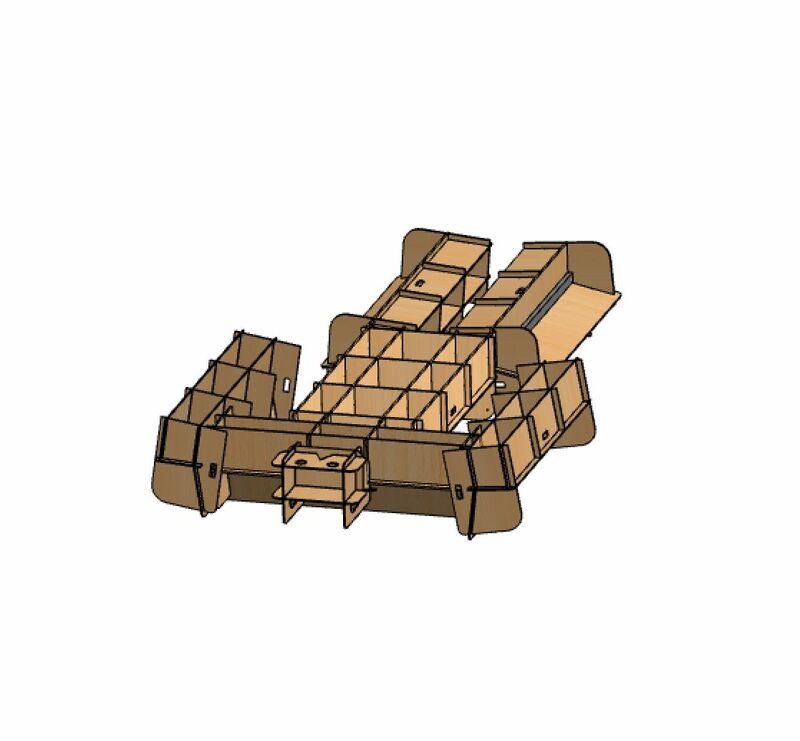 In 2011, Playatech’s long-time CAD VP Wristy rendered a gag CAD image of seven Playa Pew couches and a Playa Loveseat stuck together into a 3D robot. No one knows why Wristy did it. Sunshine laughed. And that was the end of it. 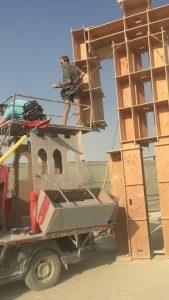 In 2017, Sunshine got upset that playa art’s value seems measured (and sponsored) in feet of height to the point of absurdity, so he wrote his first ever blog, declaring BRC the first city in history where at least for a brief time, Shakespeare’s “All the world’s a stage…” is pushed to its ultimate limits, by everyone, in everything we bring, wear, ride, work in, live in, and do. Then Sunshine calmed down. And that was the end of it. 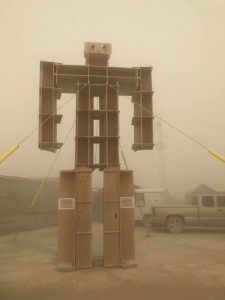 Soon, the 2018 Burning Man theme “I, Robot” was announced, so Sunshine dug up the old robot image and posted it with the words “Circa 2011: Larry, we’ve been waiting for you”. 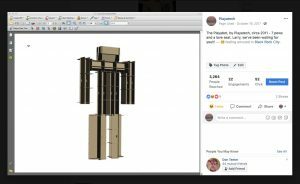 He thought, “wouldn’t a big tall robot made of Playatech furniture be a great spoof on big expensive art?”. And that was the end of it. Then we lost Larry, and Sunshine simply had to stand up Wristy’s 2011 joke in tribute, and do it the way we used to build big art, half of Burning Man’s age ago: creative cheapness not big bucks, crowds not cranes, and communal effort drawn from participative immediacy, not forms and departments. 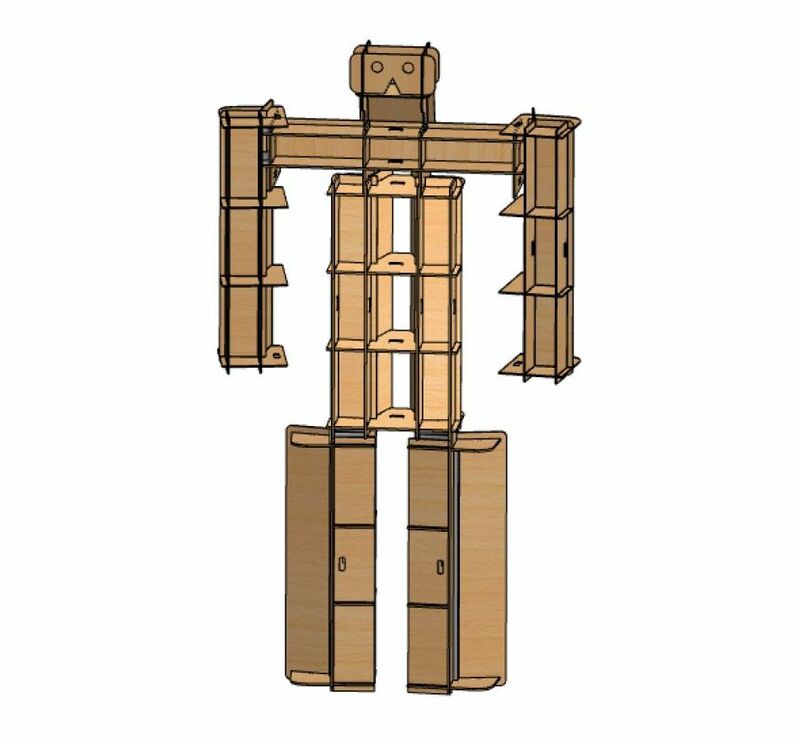 But it was too late to create a team to turn 16 sheets of plywood into a robot. And that was the end of it. 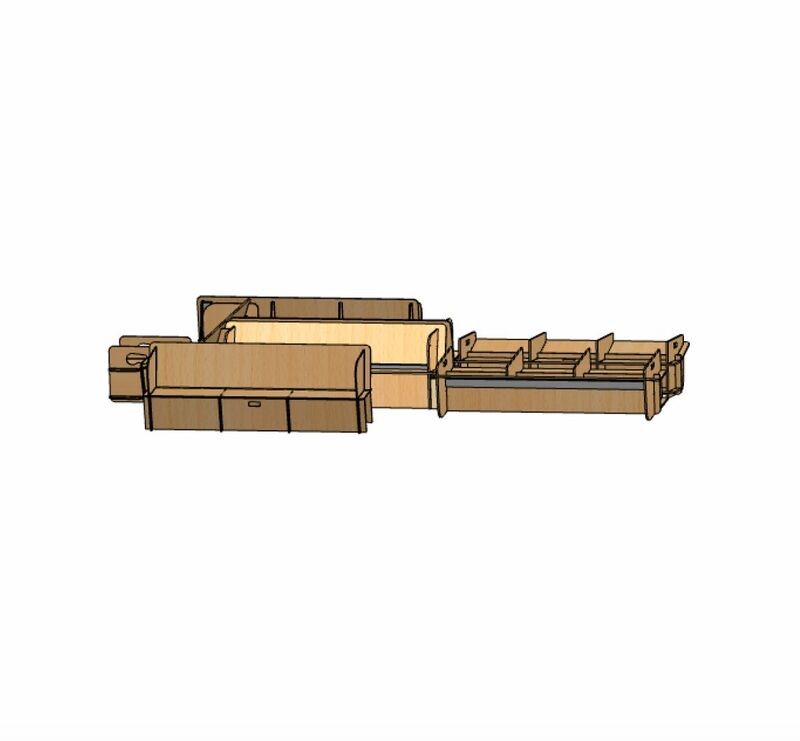 As summer approached, a couple guys near Seattle wanted to make CNC Playatech furniture for sale, and were conscious enough to ask how we could fit their commercial desires with Playatech’s completely non-commercial ones. 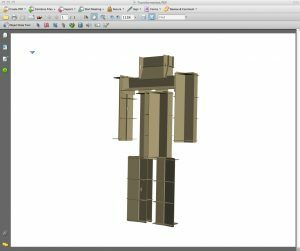 In discussing that, Sunshine asked Greg and Danny if they could CNC the robot from 2011 and got a yes – and so, in mid-July, Splinter was born. Thanks guys! Wristy took on the complex process of designing and building all the stiffeners, spacers, and extra slots needed to hold Playatech couches up in all the wrong ways, while Sunshine helped him turn the two back-to-back pews of Splinter’s torso into one stronger back-to-back couch now called AirPart Seat (a spoof on airport seating that is typically back-to-back so we don’t have to look at strangers). 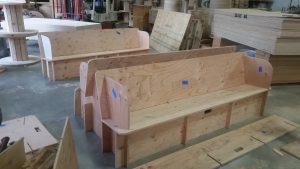 Greg took on getting 16 sheets of plywood turned into Splinter’s seating components at a local shop, and the CNC ran in mid-August. 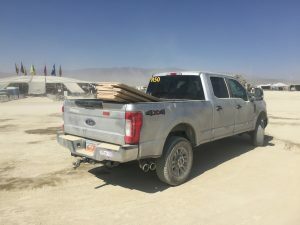 With under a week to playa and parts in 2 states, there was no pre-build. 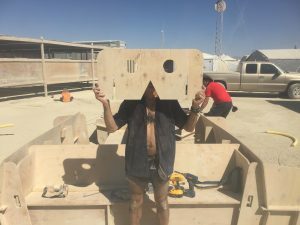 While wrapping up the design, we found a wonderful Seattle-area camp called Tautology to bring Splinter to playa. 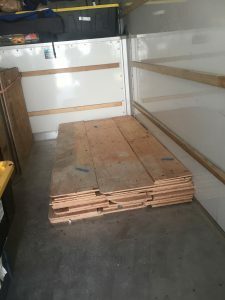 He only took a 4’x8’ area in their box truck, under one foot high. 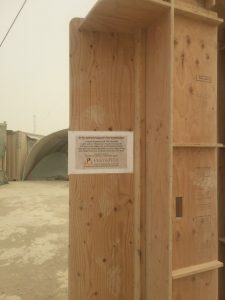 They are an art support camp so they delivered him right to our erection site, and also showed up at exactly the right time the next day to help raise Splinter, which promised to be fun since we promised to do it wrong. Thanks for enabling our project! Sunshine wanted Splinter at the frontage of Awkward & Tawdry Lounge in Center Camp Plaza, but there wasn’t room. So, he asked Wristy and Elecktra if we could raise him adjacent to Playa Info, on space normally fronted by a fence and a signage tower. They said “sure, it if doesn’t interfere with the tower”. 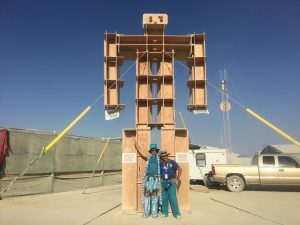 The playa gods intervened and the tower accidentally got built in the center of their camp instead of the frontage, clearing the way for a 23’ tall robot in Center Camp, without checking a singlebox on a single form. Score! Thank you PI for hosting Splinter!!! 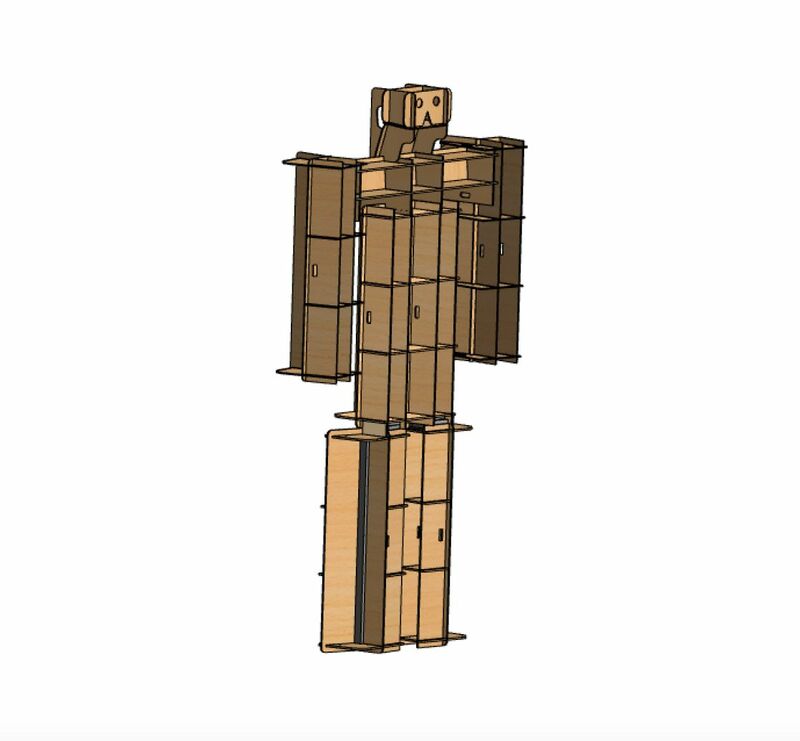 We hoped to raise Splinter Friday pre-event at 4:20PM, but he did not arrive until Friday morning, so we spent the day getting his legs, arms, torso, shoulders, and head assembled into seating, and then connected together. Many thanks to those who helped on the fly! Especially those from PI. By Saturday afternoon Aug 25th we were ready to raise Splinter, but winds were gusty and dusty. Sunday a blow out was predicted, so with a crowd gathering, at 4:20PM Sunshine shouted “it’s now or never”. He pulled the handy Playatech Castle behind the face-down robot to use as a fulcrum, and we pulled Splinter up by his own guy lines. Watch him go up in the first minute, while dust hit moments later as we messed with stripped wire rope anchors. 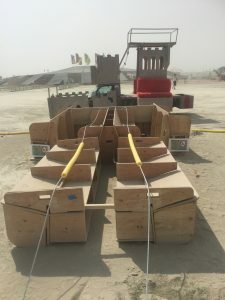 With wind gusting, we had to add a few screws to keep parts from sliding out that were not accessible underneath him on the ground, so we used the Playatech Castle car again as a mobile scaffold. That night, we had a high wind event and folks wondered how Splinter would do, but Sunshine later found out the guy lines could have held up The Man. On Sunday Aug 26, it was indeed a windy whiteout, with the gate closing during the event’s busiest entry time. While chaos ensued, Sunshine climbed the Castle’s scaffold to light Splinter for the week. His eyes were low-cost RGB garden motion lasers, which rock in the dust. We mechanically blocked potential laser projection angles to the ground with large red trailer reflectors mounted on yellow funnels: headlights from a retired Playatech mutant vehicle. On Splinters chest were 3 letters done in rope lights, which were changed each night: a red “P” for Playatech, a blue “I” Playa Info logo, and a color-changing “S” for Splinter (a spoof on Superman). Some nights multiple lights were activated, and when the red P became superimposed by a red S, it formed a strange Martian symbol in subtle tribute to the old DISORIENT. Splinter’s guy wires contained motion LED spotlights that lit him in response to nearby/loud sounds, as well as safety rope lights. On Sunday Sept 2, it was time to strike Splinter, and we promised to “do it wrong” again! While two of us tugged the front guy lines to lean him forward, just three people held each rear guy line. Then the front two ran to the back which added up to not nearly enough, and as Splinter became too heavy, Sunshine said “let go on 3…3!” And Splinter face-planted nicely. We considered sticking wheels on Splinter, towing him to the Man platform, and raising him again to burn the first robot at BRC’s center just like we burned the first woman there in 2006, but that seemed like too much work – and an environmentally unsound waste of perfectly good robot parts, likely requiring forms and an army of fire guards to keep the Org out of trouble. So, to leave no trace in a novel way, we decomposed Splinter into 5 Playa Pews, 1 AirPart Seat, and one very strange little chair that was his head. Then we offered the furniture items to Burning Man departments as gifts: HEAT, Hell, and Recycle Camp all got some – and of course, the AirPart Seat went to BRC Airport! Sunshine is saving the head for the Smithsonian (LOL, NOT, but it has already graced a rockin’ Dust-Off event). 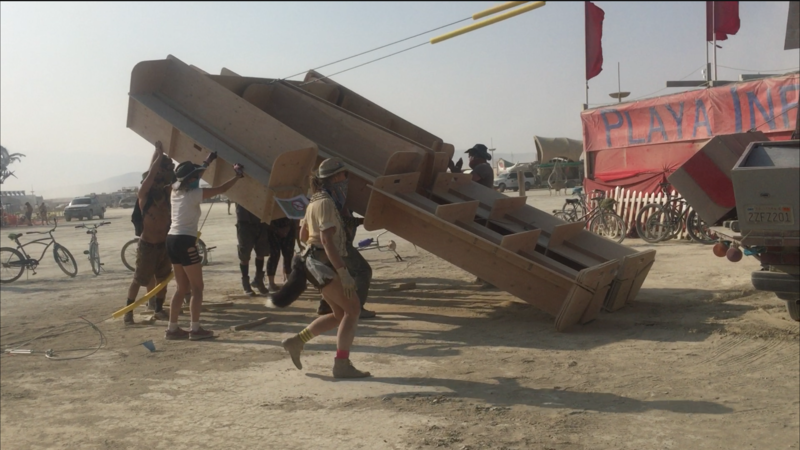 And that really was the end of it – but maybe not quite: every piece of Splinter that lives on is a template for another Splinter, or enough Playatech to transform a camp, or a festival. Smart robot indeed!